10) and did I mention the beautiful, white sandy beach with beautiful shells? I wish I could say it was also totally easy peasy, but that would be understating things. Because for every week of vacation taken these days, there are at least two weeks of work before to prep and after to unwind, not to mention the parenting in between. First off, herding the stuff is a challenge. We have created the “family master packing list”—and though it is not easy anticipating what two small humans in addition to their parents will need—we somehow got everything in there. We had diapers.com send us the necessary diapers, swim diapers, and snacks snacks snacks. For nourishment, we splurged and had the local grocery that delivered and unpacked groceries to our condo (best $25 ever spent on delivery ever). On the way there and back, my husband did look like an overburdened sherpa on the way to Mt. Everest, lugging two huge britax car seats and two suitcases. Meanwhile I had little Miss in the ergo, a stuffed-to-the-gills diaper bag on my back, all while holding the little dude’s hand; he also did his share, with toddler backpack full of toys on his back. Entertaining two children on the flights did require some creativity--an iPad and those toys for our son, and aisle-walking the duration of the flight for our daughter. Also, try applying sunscreen and changing two squirmy children in and out of swim diapers and sandy bathing suits multiple times a day for a week. I personally would break out in a sweat each and every time. So it wasn’t without some work. We planned a Friday-to-Friday vacation with a weekend at home to recover from the return flight—and boy did we need it. But at the end of the day, it was so worth it. We had a phenomenal time, and our trip gave us a taste of family vacations to come. The highlight reel: For the journey, the kids were so well-behaved on both flights that multiple fellow passengers congratulated us baggage claim. And we scored the free minivan car rental upgrade (you know you are a parent when that kicks things up a notch). On the beach, we had daily dolphin sightings straight out of the nature channel, and went out for a family ice cream every afternoon after nap and in between beach and pool. And for some couple time (figure that): my husband and I went out for dinner 5 nights out of 7, thanks to two great evening babysitters. Now that is a vacation! But most of all, the dude and little miss enjoyed frolicking in the sand and ocean, and taking in the sound of the waves, sun, and salty ocean air for a week rejuvenated both my husband and me. So the question is: where next? How can we top this one? If you have any fabulous vacation destinations, please do share. Stay tuned family, summer vacation is just around the corner! Sounds wonderful. We had an excellent experience at The Breakers, West Palm Beach. We stayed on the club level and they were so accommodating of all of twin 2 year olds needs. VERY child-friendly resort! Beach vacation are one of the best and interesting kind of vacation and it was great sharing buddy. 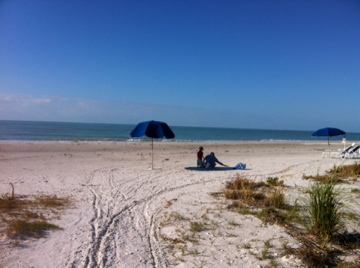 We have been going to sanibel every summer for the last 25 years. Was it Bailey's or Jerry's that delivered groceries? I didn't know about that! Also, would you be willing to share the names of the babysitters that you used? Jerry's. The best! If you send me your email or phone, we can chat about the sitters. We go down with my parents and my brother and his kids, so between us we have 5 little ones and have never known who to ask for a babysitter recommendation. With that many kids (split across two condos) we would probably need both sitters at once! yes, it's daunting to find babysitters. with a place as small as sanibel, we went word of mouth and also through sitter city. am emailing you one sitter who will likely be available--the other is leaving town in a couple of weeks. good luck! I was looking for blog posts about Sanibel Moorings to share on our site and I came across your post...If you're open to it, shoot me an email at jane(at)dwellable(dot)com.